Why « Smadj » because of his real name Smadja ( born in Tunisia, raised in France) not so hard to find his artist name…Smadj’s musical development came to be characterized by transforming jazz styles into eclectic sounds or the contrary. This interest in the mechanics of making music led Smadj to pursue a degree in sound engineering, which led to a fruitful career as a recording & sound engineer for famous classical and folk musicians. Releasing his first album in 1994 with crazy 8 pieces band called Tatoom, it wasn’t until 2000 that Smadj became recognized on an international scale(Melt 2000) for his signature blending of acoustic and electronic sounds on Equilibriste(featuring some of the best french jazz musicians: Magic Malik, François Thullier, Cyril Atef, Stefano di Baptista…) , which would ascend on the European World Music Charts to the number 4 position. 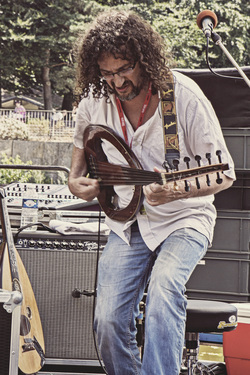 In 2002, Smadj joined fellow ud magician, Mehdi Haddab(Ekova , Speed Caravan), for a special project that would transport the oud to the 21st century in DuOuD. Supporting their triumph of an album with a 2 year world tour, the album also received 2nd place in the Best Album category at the prestigious BBC World Music Awards. So few albums and stories later Smadj’s dreams come true, the release of his fifth album with Erik Truffaz and Talvin Singh, a trio dedicated dedicated to love…. The last album "Spleen" was released the june 2015 with the french label "Jazzvillage" with few very good jazz players like Bojan Z and Ibrahim Maalouf...and was well received by the radios and press.